My son-in-law, in his quest to clean up the fence line, chopped away half of my Gardenia bush with a machete. The back half. This was a large bush, about 6 ft high and about the same around. We've use pruning shears on the jagged cuts where we could find them. Some of the branches in the front have been sliced downward. Should we cut back the sliced ones? And will it survive? Every day that goes by I see more and more yellow leaves. What can we do to help it through the upcoming winter months? We live in southwest Florida. Any help would be appreciated. It is hard to say if it will survive. Gardenias do not tolerate severe pruning well. But you do have a chance that it can recover. I would clean up any split branches, as these will invite disease. I would also start the plant on a schedule of fungicide and pesticide. 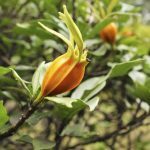 The reason is that fungus and pests are attracted to sick and damaged plants and this would be devastating to your gardenia in its current state. Also, give it some balanced fertilizer, and if you get any unexpected cold snaps, make sure you cover it with a sheet at night, as it will not likely be in full dormancy due to the pruning and will be more susceptible to cold damage.